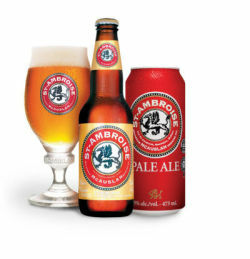 St-Ambroise Pale Ale is the brewery’s flagship beer. Introduced in February 1989, it is a hoppy, amber, full-flavoured ale. In The Simon and Schuster Pocket Guide To Beer , beer critic Michael Jackson gave it three stars and described it as: "An outstanding ale... amber-red, clean and appetizing, with a very good hop character, from its bouquet to its long finish. Hoppy, fruity, and tasty all the way through." UPDATED: APR 16, 2018 Bottle with GDA. Hazy orange with a frothy head. Aroma of pale orange malt. Flavour is malty grain, some fruit syrup. 0,473l can. Poured copper with white head. Caramel, bitter hops. Quite close to english bitters. Nice hop finish. UPDATED: JAN 9, 2018 11.5 ounce bottle into pint glass, E068 bottle code. Pours slightly hazy/cloudy deep orange/amber/light copper color with a thin off white head with decent retention, that reduces to a thin spotty lace cap that lingers. Minimal spotty lacing on the glass. Good appearance. Aromas of grapefruit, tangerine, peach, pineapple, lemon zest, orange peel, light pepper/pine, honey, caramel, brown sugar, toasted biscuit, herbal, and floral/grassy earthiness. Nice and pleasant aromas with good balance and complexity of citrus/earthy hops and dark/bready malt notes; with solid strength. Taste of grapefruit, tangerine, peach, pineapple, lemon zest, orange peel, light pepper/pine, honey, caramel, brown sugar, toasted biscuit, herbal, and floral/grassy earthiness. Light pine, citrus peel, herbal, grassy, spicy bitterness on the finish. Lingering notes of grapefruit, tangerine, peach, pineapple, lemon zest, orange peel, light pepper/pine, honey, caramel, brown sugar, toasted biscuit, and herbal/floral/grassy earthiness on the finish for a while. Nice complexity, robustness, and balance of citrus/earthy hops and dark/bready malt flavors; with a nice malt/bitterness balance; and zero cloying/astringent flavors after the finish. Lightly increasing dryness from bitterness. Mild carbonation and light-medium body; with a very smooth, moderately bready/grainy, and fairly sticky mouthfeel that is good. Zero warming alcohol as expected of 5%. Overall this is a solid pale ale. All around good complexity, robustness, and balance of citrus/earthy hops and dark/bready malt flavors; very smooth and easy to drink with the mildly bitter/drying finish. Balanced citrus/earthy hops and dark/bready English malt complexity. Probably very old judging by the flavor profile, but was still quite enjoyable and not too bad at all. Drank more like an English pale ale with the mild carbonation. Pale ale is not my favourite style but not most disliked either. Deep gold-orange body with a thin white foamy head. Light malt dominates in the aroma with notes of caramel, grass, and a phenolic character about it. Typical pale ale flavour; light malt followed by a hop bitter after taste and a treacle-like finish. Can from an offie in Montreal. Light orange pour with a tiny head. Some dusty caramel chew on the nose. Light peach and orange zest. Drinks a bit sweet. Malt-driven profile. Gentle toast. Light spiciness. Supple caramel. Mild pine on the finish. Medium body, strong carb. Starting to discover the St-Ambroise. Got a few of these in my Gatineau go to Metro. As a Pale Ale, not the style to break a highest rating for me. An ok beer.